It’s actually longer than this, but when I tried to fit it all in a photo, you couldn’t tell how cool it really was. And baby, this thing is cool. You may just see this again when I start decorating for fall. I went to a sale at a church down the street on Friday. For the most part, it was just a bunch of old lady clothes. Not cool vintage old lady clothes from the 60’s. Just well worn old lady jogging suits, girdles and orthopedic shoes. The church is sort of known for having an older congregation. But I did find a few treasures. The white pottery vase is marked USA, so it may be McCoy. But for a quarter I didn’t even bother to google it on my phone, I just threw caution to the wind and went ahead and bought it. The scissors are HUGE. They are 12″ long and I have no idea why they need to be so big. For cutting umbilical cords? For 50 cents I can sterilize them. 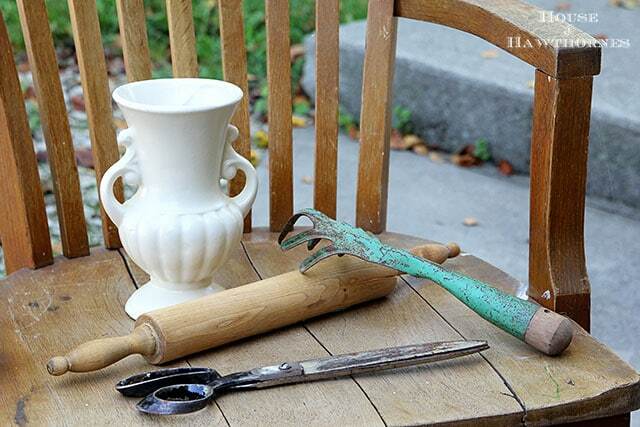 Both the wooden rolling pin and gardening hand rake were a quarter each. So that whole photo up there was $1.25. Oh, and I want to bottle this green color and sell it as paint. 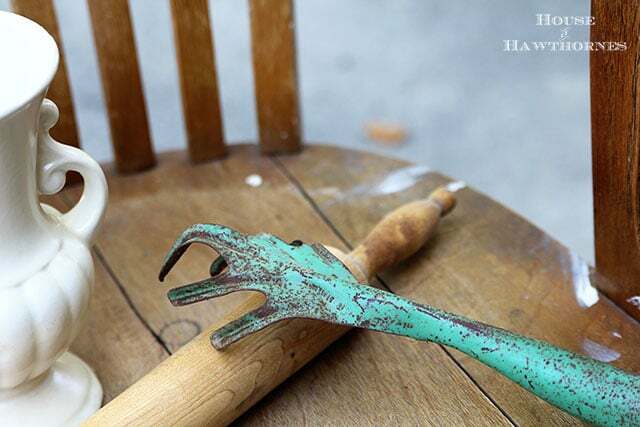 Does anyone know if I can take an old gardening hand rake into Home Depot and have them color match it? Excuse me sir, can you fit this rusty old tool in your color matching machine? The big purchase of the sale was this set of serving stuff. They actually match a larger serving set I have and use when I have parties (they have a cool mid-century retro vibe to them). All of it was $2. The little spatulas are confusing me though. Not sure why they are so darn small. I can’t think what they would be used for? How was your yard saling weekend? Did anyone make it out to the Worlds Longest Yard Sale? My crafty mother has those same larger-than-life scissors and she has used them on upholstery fabric. You really spent a fortune this weekend (hee hee). Can’t wait to see what you do with that awesome rake! I guess that means I have to learn how to upholster then! I have a little spatula, just like yours, so I am hoping someone knows what its background story is. I once painted an old plaster lamp that was white and gold that color using a painting kit, years ago. I just googled “verdigris” for the spelling but am now going to go and see what is available…it is a great color! Oh, and aren’t church sales that are run by elderly ladies just the best? Who charges a quarter for anything nowadays? I went to once very similar a couple of weeks ago and had fun and hardly spent anything. I even rounded up, big spender that I am! Gotta love a church sale…great finds! LOVE that rake! And I am guessing the little spatulas are actually serving spoons, or maybe salad tongs? Dressmaker shears, upholstery shears. Way too heavy for mortals. Look like they need a good sharpening, too. Maybe even a little steel wool too. They’re a little rusty. My Dad has his Mother’s dressmaking shears. They look just like those – big and heavy. He still takes them somewhere to get sharpened. I was never allowed to touch them and I am still kind of scared to get near them I have that same garden tool hanging on my garden hose wreath on my front door. The chippy old handle is the exact same. Also, pottery for a quarter? YES! 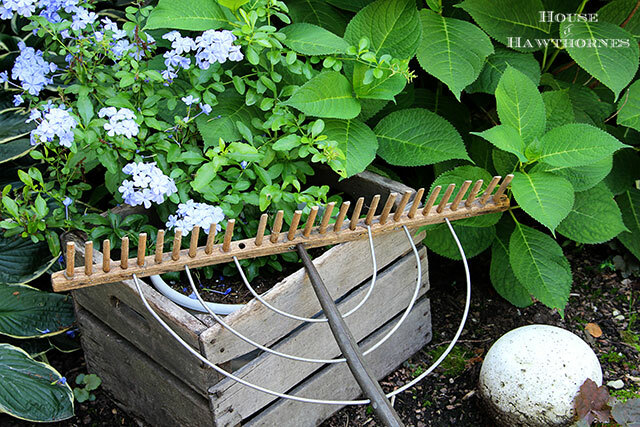 I’m crazy about that gardening hand rake. LOVE it. That green is the best color! I bet it could be color matched. Then you can sell it exclusively on your blog and become a millionaire. Good idea, huh? 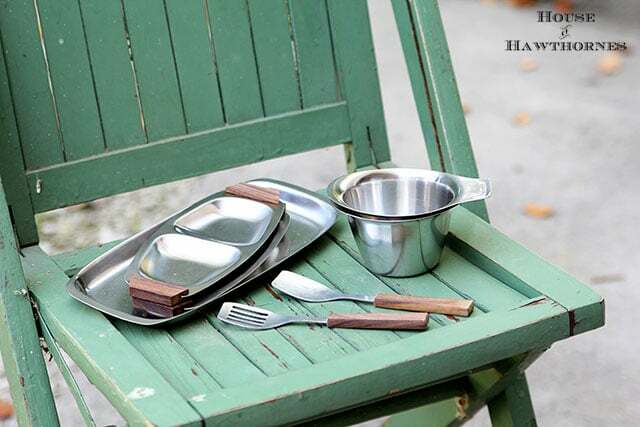 Could the “spatulas” actually be for serving salads? I have a vase very similar to the one you bought (without the handles) and use it all of the time. Looks beautiful with blue hydrangea blooms in it. Super goodies. I bet Home Depot could match that green. looks like a sunflower with a ladybug on top. I have carried in a drawer and had it color matched…I am sure they get far weirder stuff!! I love yard sales!! Great finds!